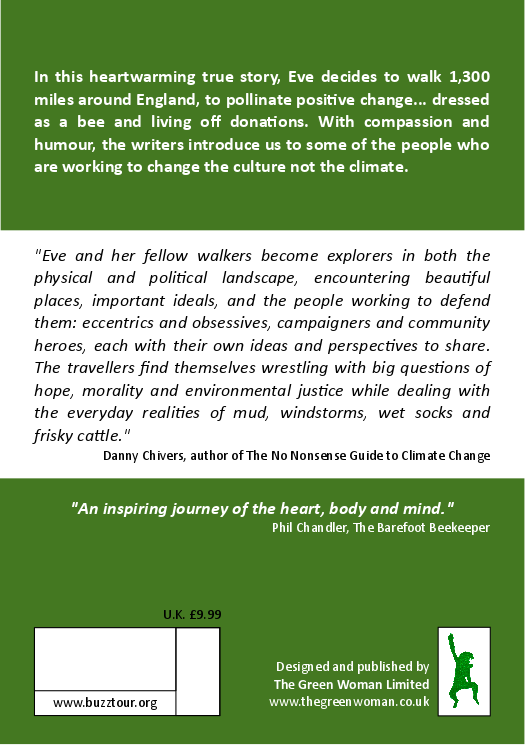 In this heart warming true story, Eve decides to walk 1,300 miles to pollinate positive change…dressed as a bee and living off donations. With compassion and humour, the writers introduce us to some of the people working to change the culture not the climate. If you would like a copy but can not afford one please email us to see if we have one for you. When you buy a benefactor copy we put a second copy aside for those less able to pay. Thank you so much to everyone who has supported this project, with love, The Bees. The early drafts of chapters 1-9 are available to read online for free. We hope you enjoy the book! Thank you! If you’d like to support our work, you can donate using the button on the right.